To increase revenue, save time and decrease the costs associated with billing, many medical facilities and private practices are choosing to outsource their revenue cycle management (RCM) and medical billing. When these tasks are outsourced to a reputable medical billing services company, patients receive the same cordial communication provided through an in-house billing department, but the provider benefits substantially because each claim is prepared and followed-up on by a specialist. Traditionally, healthcare organizations and private medical practices have maintained an internal billing structure. With in-house billing, revenue cycle management requires hiring personnel who are familiar with the process of filing, coding and managing claims. Besides the need to hire experienced staff, office space, special software and equipment are required: Outsourcing can eliminate the need for all of these. An accurate and efficient billing process is vital to the sustainability of any medical practice or healthcare facility. 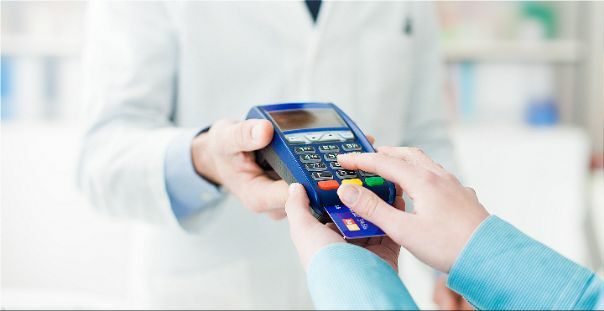 Denied claims that are disregarded, past-due patient payments and incorrect coding practices that lead to confusion can all negatively affect a practice or facility’s daily cash flow. Choosing a reputable revenue cycle management and medical billing service company can greatly increase the day-to-day cash flow of any medical practice or healthcare facility. In-house revenue cycle management and medical billing services are extremely difficult to manage. Each claim must be accurate, filed in a timely fashion and, when necessary, followed-up on to ensure payment. As such, an effective in-house billing department requires hiring staff members with excellent organizational skills who are dedicated to remaining abreast of the constantly changing billing codes. In addition, these employees must be able to speak with patients that have a past-due balance in a cordial, yet firm manner. Many providers have concerns related to the actual cost of outsourcing their medical billing; however, if the cost of training new employees and the costs associated with insuring, providing sick pay and annual raises to staff members is taken into consideration, many healthcare professionals find that outsourcing can save their practice money. The rules and regulations set forth by the government are constantly changing, which forces providers with in-house billing to retrain their staff. If training is disregarded, claim denial is imminent, resulting in decreased cash flow. 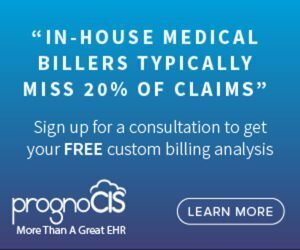 By outsourcing your billing to a company like PrognoCIS, there is no need to retrain staff members or worry about a decrease in cash flow. Medical billing specialists stay up-to-date of any changes occurring within this industry. Your practice’s revenue remains high because your claims remain free of errors despite these changes and there is no need to retrain staff members. A clean claim refers to a medical insurance claim that is perfect: It has zero mistakes, does not need additional information for processing and; therefore, has no risk of denial. Increasing revenue requires a high clean claims rate. With outsourced billing, your practice or facility’s billing structure is placed in the hands of qualified medical billing specialists who know the importance of submitting perfect claims. Outsourcing to a reputable company that hires medical billing specialists and offers innovative software solutions essentially eliminates the need for claim resubmission due to human error. Maintaining billing software and equipment is one of the forgotten costs associated with in-house billing. When you choose to outsource your billing, the company handling your billing is responsible for maintaining the billing software and ensuring that it remains up-to-date as billing regulations change from one year to the next. Billing specialists stay on top of any changes to keep your billing department running perfectly; thus, increasing revenue. Besides the aforementioned benefits associated with outsourced billing, companies usually offer a variety of other useful performance enhancing tools. A complimentary custom analysis for healthcare facilities and physician practices. A mobile app that allows for viewing and completing tasks from anywhere. A single, easy-to-use inbox from which to manage a variety of tasks. Claim tracking ability which allows the provider to follow and monitor the status of claims. A support staff that is available 24 hours a day, 7 days a week. A designated call center for patients to ensure the in-house billing feel remains intact. Checking each patient’s insurance eligibility. A dedicated revenue cycle management client services manager. Outsourcing medical billing offers providers a way to decrease costs while increasing their clean claims rate and their day-to-day cash flow. Once the headaches associated with in-house billing are eliminated, providers can focus on caring for their patients.